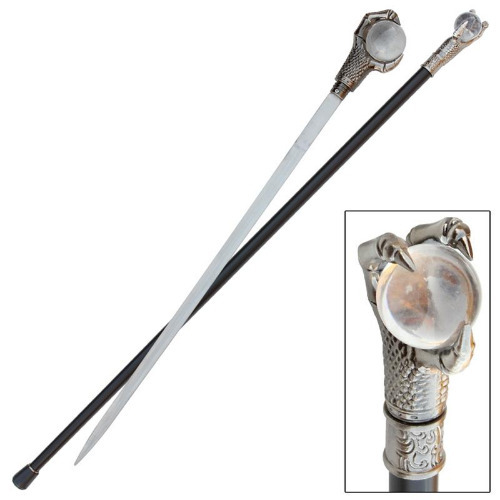 The Japanese Dragons claw that rests atop this beautiful, strong cane is holding a crystal clear orb that provides you with balance and guidance in every step. Feel the smooth crystal ball rotate beneath the palm of your hand, within the grasp of the hand polished pewter claw. Impress others with this cane in your collection. This cane is a great example of craftsman ship and durability. Screw off the handle and reveal yet another way this dragon is protecting you- a hidden sword lies just beneath the surface ready to rescue at your command.